The associate director for Basic Sciences Research is appointed by and reports to the director of the Lurie Cancer Center. She is responsible for the development and coordination of the Lurie Cancer Center's basic science research programs, as well as fostering interdisciplinary and inter-programmatic collaborations. The associate director serves on the Executive Committee and Leadership Group, playing a critical role in establishing the strategic direction, policy and priorities of the Lurie Cancer Center. In addition, the associate director is responsible for overseeing the development and operation of the Lurie Cancer Center's basic research laboratory facilities on the Chicago and Evanston campuses. 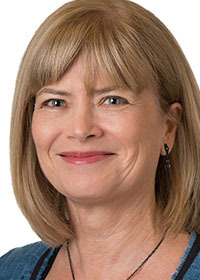 A leader in the field of epithelial cell biology, Kathleen J. Green, PhD, is the Joseph L. Mayberry, Sr., Professor of Pathology and Toxicology and a professor of Dermatology at the Feinberg School of Medicine. Her research program is focused on understanding the molecular basis for how cells stick together, not only to provide mechanical strength to tissues, but also to regulate chemical signals important for development and differentiation. Green has a particular interest in tissues such as skin and heart that are major targets for adhesion-related diseases, including inherited, autoimmune and bacterial-toxin mediated disorders and cancer. Green has served as co-leader of the Lurie Cancer Center's Tumor Invasion, Metastasis and Angiogenesis Program focused on multidisciplinary basic and translational research. She also serves as director for Northwestern's PhD training Cluster in Cancer Biology and the National Cancer Institute-funded Carcinogenesis Training Program, the latter of which provides interdisciplinary research training for eight pre-doctoral students in cancer biology. A fellow of the American Association for the Advancement of Science and recipient of Northwestern University's Martin and Gertrude Walder Award for Research Excellence, she currently serves as secretary of the American Society for Cell Biology, deputy editor-in-chief of the Journal of Cell Science and principal investigator on three grants from the National Institutes of Health, including a MERIT Award.